All subject to change, snow cover, weather conditions, safety, staff availability, maintenance and utilisation with limited areas & lifts open at the beginning and end of the season. The 3 Valleys is the biggest ski area in the World - it has 169 modern, high performance ski lifts, 600km of pistes from 3230m to 1300m, 120km of cross-country tracks, over 2497 snow cannons covering a third of the entire area in machine made snow, 73 state of the art grooming machines for 1512 hectares of groomed pistes, 335 marked runs, 25 accessible summits, 6 glaciers, 1200 lift staff, 424 ski patrollers and 3000 Ski instructors. The main news for Winter 2019 is that a single basic trip to Aquamotion is included in 2-day and above Courchevel Passes (but not season passes) and the "3 Valleys Wellness Pass" includes 2 full access trips to Aquamotion. 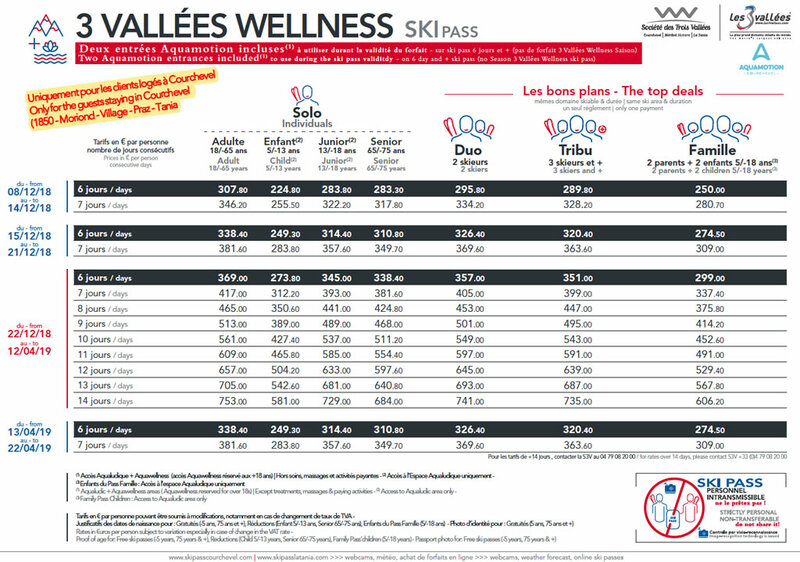 There is now a "Junior" rate on the 3 Valleys Wellness Pass (announced in November) for customers aged over 13 and under 18 who are normally treated as adults. A JUNIOR 6-day 3 Valleys Wellness Pass with 2 full access trips to Aquamotion is €345. An Adult 6-day 3 Valleys Wellness Pass with 2 full access trips to Aquamotion is €369. An Adult 6-day 3 Valleys standard Pass is €306. 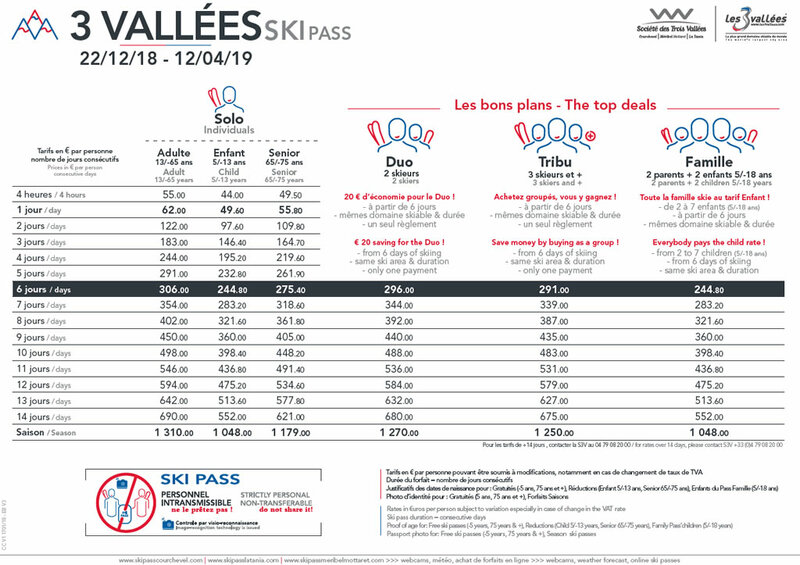 The Courchevel 6-day pass (which includes Aquamotion basic access "Aqualudique") is now €272 and the standard 3 Valleys 6-day pass €306 (a €34 difference) so if you're not going to Aquamotion and will ski another valley just once it's now cheaper to get a standard 3 Valley Pass (you used to have to visit a second time to make a 3V pass worthwhile). New for Winter 2019 to include 2 trips to the Aquamotion Centre in Courchevel 1550. An adult 6 Day Wellness Pass is €369 (compared to a 3 Valleys standard 6 day pass at €306). The DUO pass discount introduced from Winter 2014 continues (2 adult passes, min 6 days, same type dates and duration, bought together). This for example, gets a 2019 Three Valleys 6 day pass for €296 as opposed to €306. A 3.3% discount. The TRIBU discount from Winter 2013 is a discount if 3 are more passes of 6 days or more. same type, dates and duration are bought together. The Tribu discount gets a 2019 Three Valleys 6 day pass for €291 as opposed to €306. A 4.9% discount. The Duo and Tribu passes do apply right through to Season Passes with 3 x Tribu 3 Valley Season passes bought together saving €180. A 4.6% discount. The FAMILY PASS that was re-worked back in 2013 remains so all pay the same price from 2 to 7 children skiing with 2 parents. Again they must be of the same type, dates and duration (min 6 days) and bought together. Note that kids in this instance are under 18 rather than under 13 for a “normal” kids pass and you don't have to ski together! So in 2019 two adults with four kids who are aged 13 to 17 (buying 6 x 6 day 3 Valleys passes pay €1468.80 with a family pass rather than €1836 saving of €367.20 which is a full 20% discount. 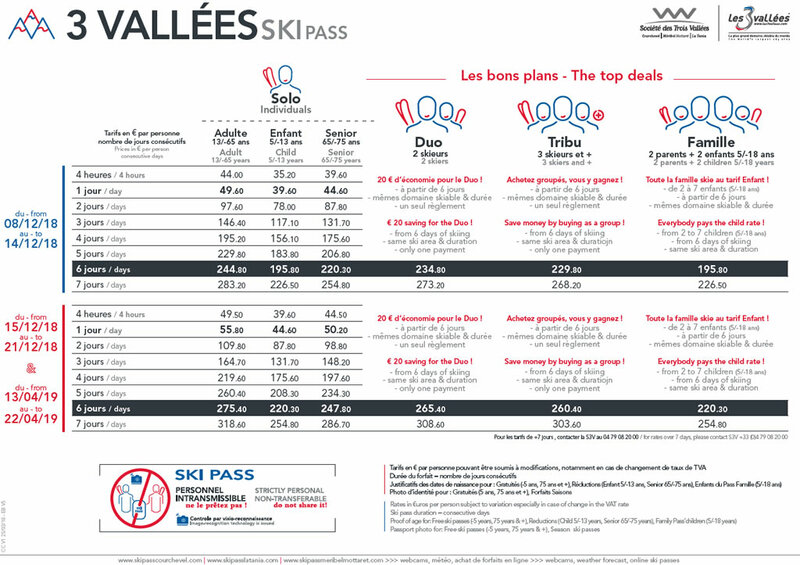 There is a 20% discount (€49.60 instead of €62 in main season) when buying a 1-day 3 Valley pass for a Saturday, so it is actually cheaper to ski The 3 Valleys than one! NOTE THAT THIS IS ONLY FOR PURCHASES ON-LINE AND THE DISCOUNT IS NOT AVAILABLE AT TICKET OFFICES. THERE IS NO CHILD OR SENIOR RATE. In 2013 the Courchevel residents preferential rate on season single valley passes was extended to include 3 Valleys season passes for the first time with a 50% discount. 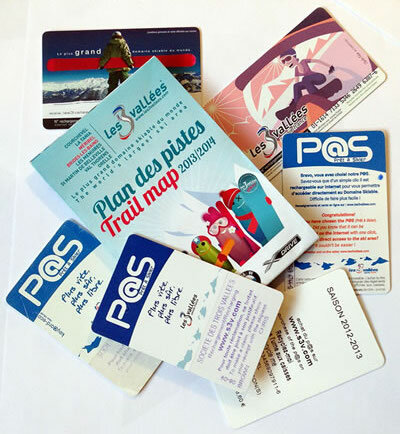 From 2014 a Workers 3 Valleys season pass was introduced giving a 30% discount - note that proof of residency, local taxes and/or employment contracts and wage slips are required to purchase these. The Epic Pass cover all the resorts managed by Vail Resorts Inc. including Vail, Beaver Creek, Breckenridge and Keystone in Colorado; Park City in Utah; Heavenly, Northstar and Kirkwood in the Lake Tahoe area of California and Nevada; Whistler Blackcomb in British Columbia, Canada; Perisher in Australia; Stowe in Vermont; Wilmot Mountain in Wisconsin; Afton Alps in Minnesota and Mt. Brighton in Michigan. New for the 2018-19 season, Epic Pass holders will receive seven days of skiing or snowboarding with no blackout dates at both Telluride in Colorado and at Resorts of the Canadian Rockies (Fernie Alpine Resort, Kicking Horse Mountain Resort and Kimberley Alpine Resort in British Columbia, Nakiska in Alberta, and Mont-Sainte Anne and Stoneham in Quebec), in addition to five total consecutive days with no blackout dates at Hakuba Valley’s nine ski resorts in Japan. 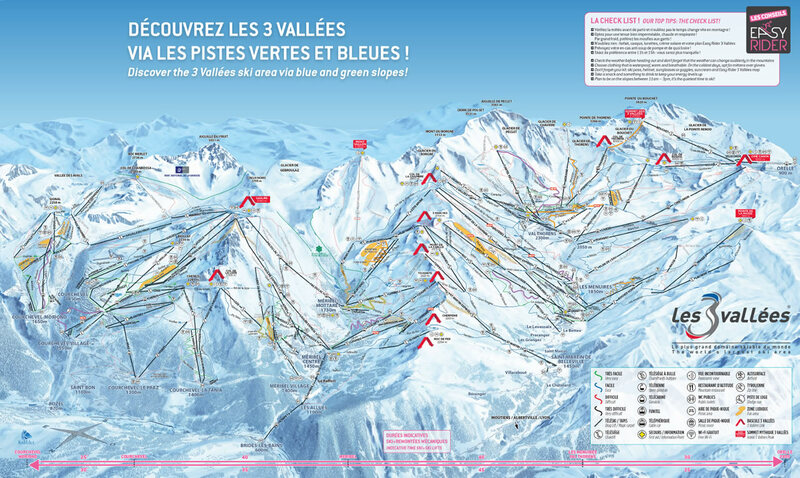 The Epic Pass also grants limited access to Les 3 Vallées, Paradiski and Tignes-Val D’Isere in France; 4 Vallées in Switzerland; Arlberg in Austria and Skirama Dolomiti in Italy. The 3 Valleys gives you 7 consecutive days while for Paradiski (Les Arcs / La Plagne) and Espace Killy (Tignes / Val d'Isere) you get 2 days in each. The 3 Valleys Ski Guarantee - simply We've More Skiing Than You! 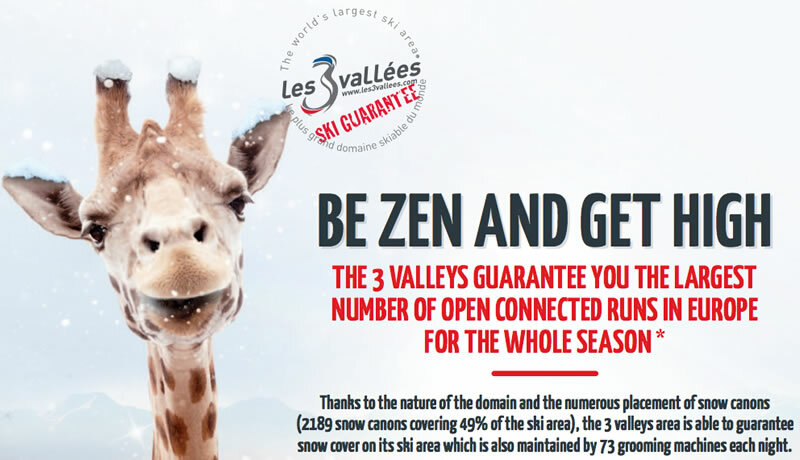 "The 3 Valleys guarantee you the largest number of open connected runs in Europe for the whole season"
Of course there's some Ts & Cs but it's a very impressive claim - Why would you go and ski anywhere else? Plenty of people get caught using passes not belonging to them every year, any unusual patterns of riding lifts etc alerts the lift companies and automated facial recognition as well as manual spot checks are made. So they can track you big brother style but this can also help in rescues and season pass users can be told the amount of vertical they've skied and number of lifts ridden in the season. The deposit charge for re-chargeable passes was removed from Winter 2017. There can be re-charged via the internet so no need to visit the pass office. Lost passes can be replaced if you keep your receipt (less an admin charge). Lift passes are available all day from the Gondola lift pass office in La Tania from 08:45 to 16:45 (open to 17:05 from 10 Feb 2018) or available on-line. Photos are only required for season passes or the free under 5 / over 75 passes - the lift staff take these photos and store them electronically (they can be checked at lift stations on screens and hand held units). All staff speak English and they do take all major credit and debit cards. Note however that your chalet staff, rep or apartment agency may sort passes out for you, have included it in your deal and have them delivered to you on the morning of your first ski leaving you without any hassle or queuing. Family - 2 Parents plus a minimum of 2 children aged over 5 and under 18. 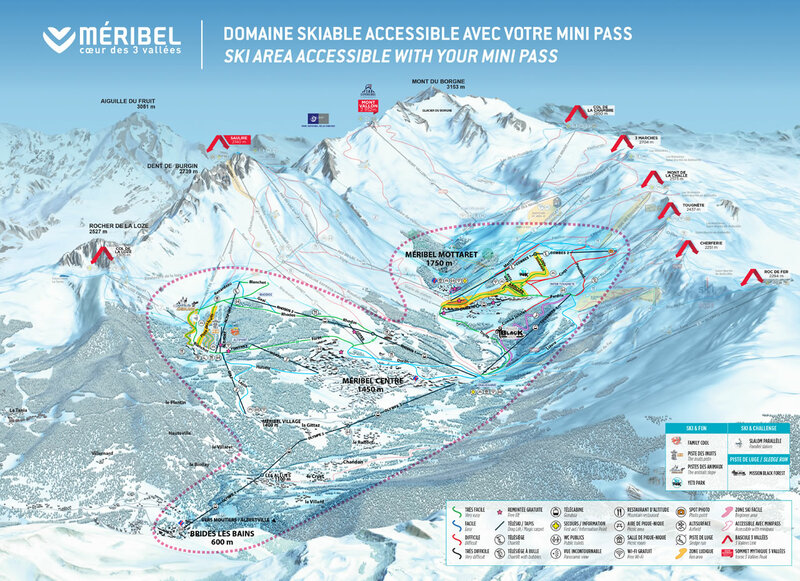 Gives you access to all the lifts in 1850, 1650, 1550, Le Praz and La Tania - still a huge area to ski and will usually be fine for beginners. 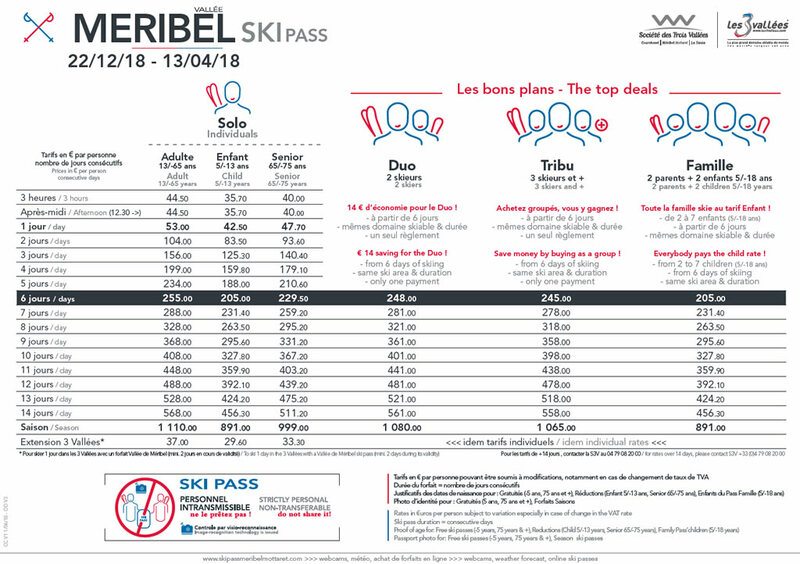 It is possible to buy 1 day extensions to make it a 3V pass (Adult €37 for 2019) and this may be an option if you only intend to head over to the Méribel side once in the week (Méribel can be a lot sunnier in late afternoon in January than the Courchevel Valley). 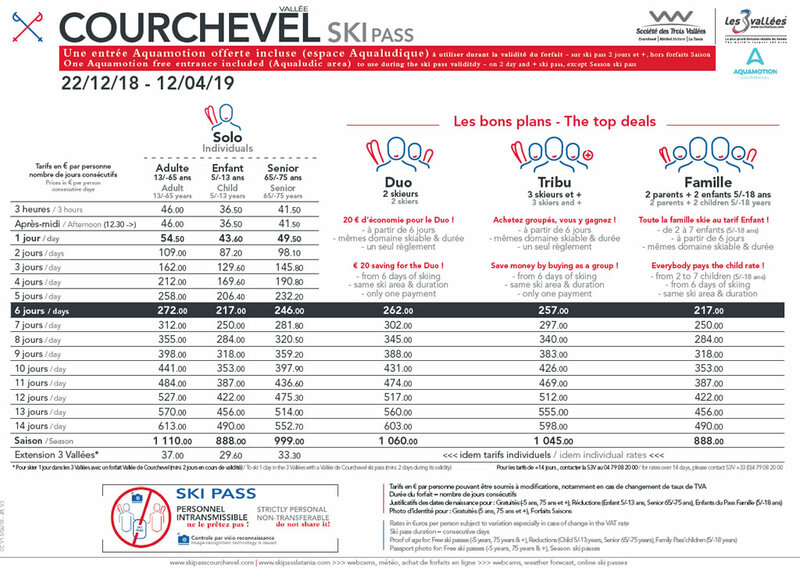 However for the first time in Winter 2019 - With a Courchevel 6 day pass ski another valley just once it's now cheaper to get a 3 Valley Pass. 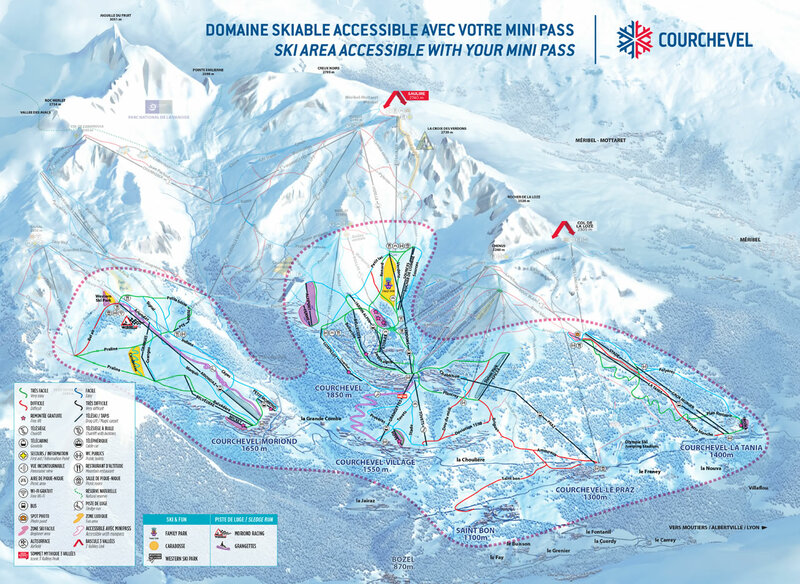 Lets you use any of the 185 lifts and is recommended for most skiers and boarders to explore the entire 600km of pistes throughout Courchevel 1850, 1650, 1550, Le Praz, La Tania, Méribel, Mottaret, Méribel Village, Val Thorens, Orelle, Les Menuires, St Martin de Belleville and even Brides Les Bains. All skiers pay the same price (eg €244.80 for a 6-day 3 Valleys - 2019 main season instead of €306). They must be of the same type, dates and duration (min 6 days) and bought together. Note that kids in this instance are under 18 rather than under 13 for a “normal” kids pass and that separate passes are issued, you don't have to ski together! So in 2019 two adults with four kids who are aged 13 to 17 (buying 6 x 6 day 3 Valleys passes pay €1468.80 with a family pass rather than €1836 – a saving of €367.20 which is a full 20% discount. 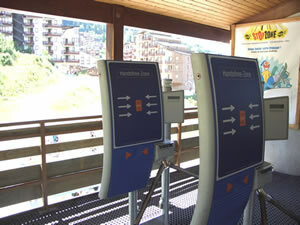 For access to the main gondolas and cable cars. Note that from 2005/6 the ski bus no longer requires any pass - it was very rarely checked anyway. Pedestrian Pass costs €24 per day or 6 days for €74. 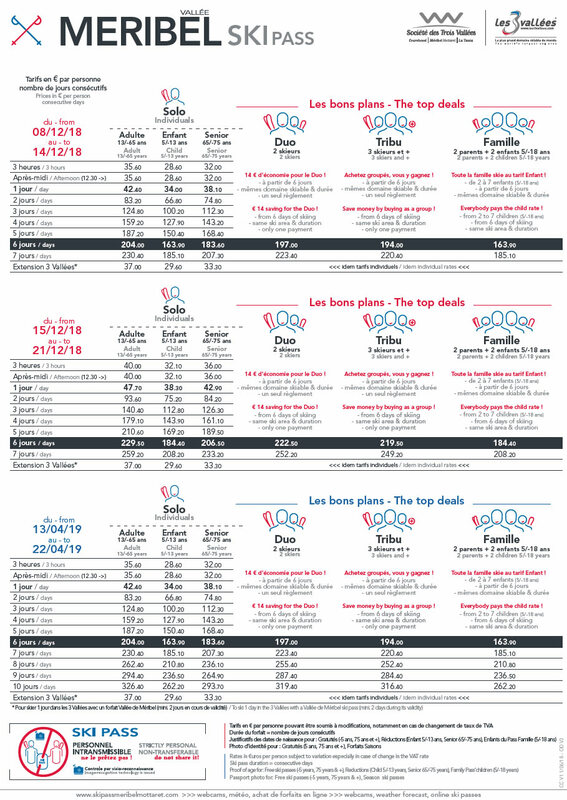 You can have one ride up the La Tania gondola for €10 (or €16.50 up 2 lifts) if you fancy lunch at the Bouc Blanc or Roc Tania... All descents are free. To help with the morning commute the Praz, Grangettes and Jardin Alpin gondolas are opened free of charge to pedestrians from 08:35 to 09:00. For skiing from 8/12/2018 to 21/12/2018 various discounts available depending on lift openings with possible additional discounts if there is limited area skiing. Discounts apply to family passes, kids and Duo/Tribu deals too. Valid from the 13/04/2019 to 22/04/2019. Various discounts available depending on lift openings. La Tania: La Tania Gondola, Gros Murger, Stade, Troika* Drags and the *magic carpet at the top gondola station. Le Praz: Praz Gondola and Epicea Drag. Courchevel Village 1550: New Grangettes Gondola, Tovets Chair and *Roys Drag. Courchevel Moriond 1650: Ariondaz and *Petit Moriond Gondolas, Belvedere, Granges, Petite Boss and *Mickey Drags. Courchevel 1850: Jardin Alpin & Verdons Gondola, *Bellecote, *Cospillot, Etoiles, Ferme, Altiport, Sources and Rocher de l'Ombre Drags plus the *Magic Carpets near Biollay. Troïka and the carpet at the top of the gondola in La Tania, plus Mickey & Petit Moriond in 1650, Roys in 1550 and Bellecôte & Cospillot plus the carpets near Biollay above 1850. Note Belvédère in 1650 is no longer a free lift from Winter 2018. As well as the free drag lift Troika in the centre of the resort for absolute beginners and a further 7 free beginners drags around the Courchevel Valley (see above) - All under 5s and over 75s ski free everywhere (proof of age and photograph required to obtain the pass). This is now a pay as you go pass - debits from your bank account when used and updates as you cross in to another valley. There's a 10% per day discount on the single day rate of Courchevel or Three Valleys prices. €12 saving on Saturdays on The Three Valleys (but anyone can get that on-line). A free 3V day on your 9th day of skiing and then a free day every 6 days after that - that's 2 free days after spending over €700. Always based on Adult full day prices (no kids or afternoon only discounts). Admin charge on top of all this of €30 per year - will be automatically deducted the year after too! Generally not worth having unless you hardly ever ski some consecutive days (and not Saturdays as anyone can get the €12 discount online). If you take advantage of the free days note that a season pass starts looking attractive after only 21 days consecutive. Requires photo and booking on-line, website is not the best either. You can't check photos on multiple accounts for example! Discounted season passes for workers and residents are now available for the 3 Valleys as well as the single valleys. A fair bit of bureaucracy and proof of income and/or income tax paid locally required to get these, not easy to fiddle as in years gone by and there are plenty of checks for the remotely stored photo - lifties have WiFi enabled hand held terminals and to do spot checks in the queues and there's now the use of facial recognition technology too (not the camera pointing in your face next to the sensor at the turnstiles). Even if you're paying full price and going to ski most days in a season then it's obviously worth getting a 3 Valley pass (as long as the people you ski with have got them of course!). It saves the hassle of getting extension passes and you will be encouraged to ski more. Note however, that multiple extension passes can now be bought in advance, loaded on to your pass and then they are triggered by simply using another valley lift turnstile. The difference in price is FIVE 3 Valleys day extensions (do 6 and you've saved money with a 3V Season Pass). All season passes are valid through the Summer lift opening for hikers and bikers too. 2 days in 3 resorts of the Vail Resorts group - Vail, Beaver Creek, Whistler Blackcomb, Breckenridge, Keystone, Park City, Mountain Resort, Heavenly, Northstar, Kirkwood, Afton Alps, Mt. Brighton, Wilmot, Perisher and Stowe. Additional benefits not applicable to residents or workers. Prices do not include insurance - Carré Neige is €2.90 per day for Adults or €23.20 for 8 to 21 days. The season long "Carte Neige" is around €70 and available from the Tourist Office / Club des Sports. Price to be confirmed for 2019. For Summer 2018 the La Tania gondola lift was once again FREE and open every day except Saturday (9.30am to 12.30pm and 1.30pm to 4.45pm) from Saturday 7 July to Friday 31 August. 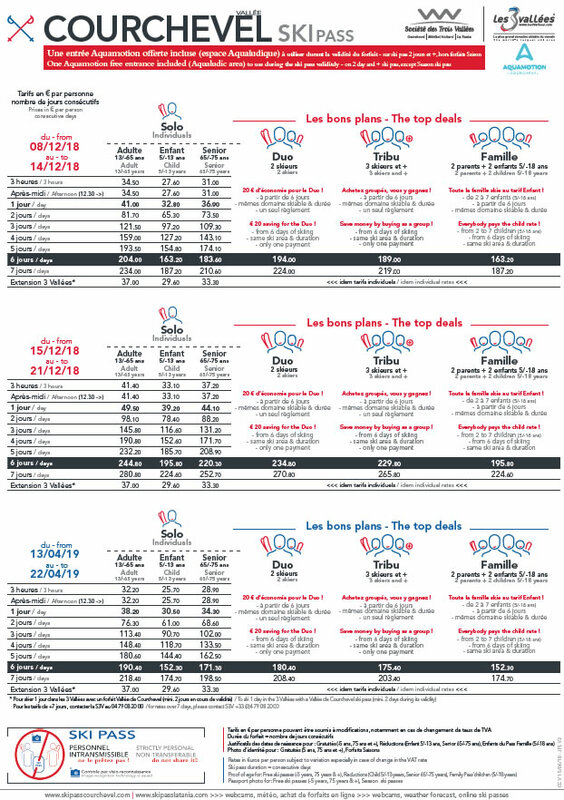 Praz, Verdons, Saulire and Pas de Lac (on the Méribel Mottaret side) were open every day except Saturday from 09:30-16:45 (Saulire closes 16:40) from Saturday 7 July to Friday 31 August. Tougnette 1 in Méribel was open EVERY DAY for Summer 2019 (yes France, people do come out for weekends, it's not purely a changeover day with nothing to do!). Adult prices for Méribel Mountain Biking were €17.50 for a full day, €82 a week or €260 for the Summer season. Pedestrian passes were €7.50 for one trip up or €12.50 for two trips, €17.50 for a full day, €52.50 a week or €160 for the Summer season. Remember - Winter season passes are valid in Summer too with a single valley pass being upgradeable to 3 Valleys for €49 for the whole Summer (and of course remember there are free lifts in Courchevel and La Tania). Bikes are also allowed on racks or trailers on the free ski bus services too (makes a trip via Brides-Les-Bains possible for example).